This is where you wish you had been - in Pontarlier at the 2006 Absinthiades. We wish we were there too. There still might be time to arrange a trip to the 2007 ones! Note: Thanks to a note from Alan, we've been corrected and while the photos are from the 2006 Absinthiades, the link is for the June FÃªte de l'Absinthe Ã Boveresse, a completely different event. Okay, we'll sign up for both! Thanks to Salsa's Absinthe Blargh for the Flickr link. 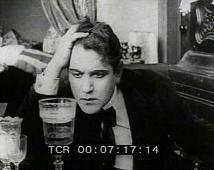 Someone recently asked us about buying absinthe from a European dealer and having it shipped to the US. We think the answer might interest more folks, so we'll post it here. Mind you, this is just for the United States and reflects our success here at getting absinthe. We have been successful all five times we have ordered so far, but as they say about the stock market, past success is no guarantee of future results. But it comes in a discreet box and shouldn't raise any interest in the post office. And the recommended vendors all guarantee delivery, so it's a no loss situation. The Duplais Series is terminated. There won't be any new products. We will continue producing all three sorts. The new series is going to be the consequent successor. I can tell you more in about 2 weeks. The label - oh, I can't tell you that at the moment, but it makes me smile each time I think about it. I can tell you more in about 2 weeks. The Prototype 31 Blanche (nearly gone), is ment to be a kind of educational thing. It shows what aging does and side by side with the (soon to come) Prototype 31 Verte, what colouring does. It's primarily not done for the colour, but to completely change the overall character of the Blanche. However the coloring has to fit to the herbal mixture of the Blanche. The nutty taste a few of you described may originate from the Marc de Dole we were using. We have to wait and see, how this developes and maybe lessen it a bit. The samples of the Verte I sent very few of you, are from our very first 'experiment' - we changed this and that already. The final product will be aged a bit. We're actually distilling it this week and going to offer it in about 6 weeks. It will be much more complex - or demanding as the Duplais Verte. Maybe not so much everybody's darling, more something for connoisseurs. Hope you like it! And yes, I'm sure we'll like it! The 5th Tales of the Cocktail conference in coming up in New Olreans. This year, it is from July 18-22 and promises to be another fun-filled, bar-hopping, cocktail-drinking, good time. 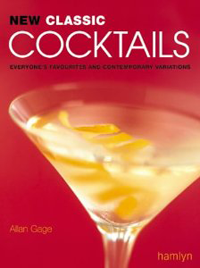 See New Orleans and hear talks by legends in the drink-mixing game like David Wondrich, Ted Haigh ("Dr. Cocktail") and Jennifer English. 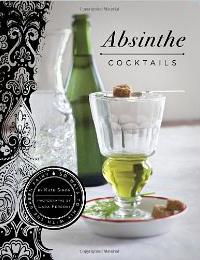 Get your tickets early for Ted Breaux's absinthe talk, as it sold out quickly last year. 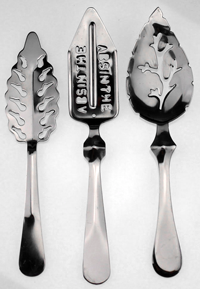 Some pretty cool absinthe tchotchkes you can buy, courtesy of The Wormwood Society. From t-shirts to coffee mugs, from thongs to baby bibs, you can proclaim your love of all things absinthe, as well as publicize the wonderful folks of the Wormwood Society. We particularly like the "Friends don't let friends burn absinthe" designs. The rich scent, full taste and spring green color can be carried back to the use of carefully selected herbs. These herbs have first been macerated in a high quality base alcohol such as has been applied in the Dutch liquor tradition for centuries. The macerate is being distilled, so that unpleasantly bitter and harsh compounds remain in the still while the desired aroma's find their way into the distillate of Helfrich absinthe.